Cute little frog telling us how to find our prince:You have to kiss more than one frog to find your prince. 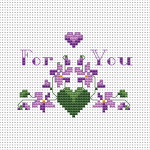 Decorative cross stitch pattern of violet and green hearts with the text "For You"
Stylized cross stitch pattern with floral motifs and hearts. 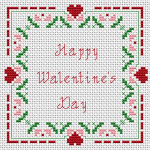 Beautiful pink rose on a light green background and the text:For You. 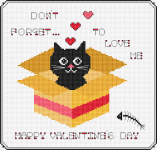 Funny cross stitch pattern of a cat peeking out of a box with the text "Don't forget... to love me." 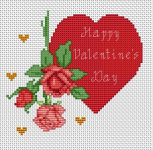 Cross stitch pattern of a big red heart ,roses and the text:Happy Valentine's Day. 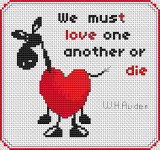 Adorable piggy holding a heart with the text "Will you be my V..."
Funny pattern of the text "I love you " stitched with very bright colors and suitable for bookmarks and greeting cards. 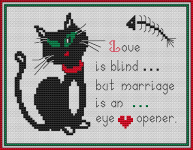 Bookmark cross stitch pattern with the text:"In love, one and one are one." Jean-Paul Sartre.